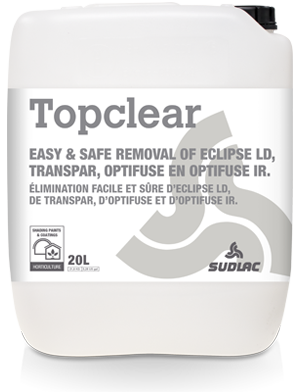 Topclear is the cleaner for effectively removing Sudlac removable shading and diffusion paints. With Topclear growers have full control when they remove the paint from their greenhouse. Paints are applied in spring to control the light level in your greenhouse, thereby creating optimum light conditions for your crops. 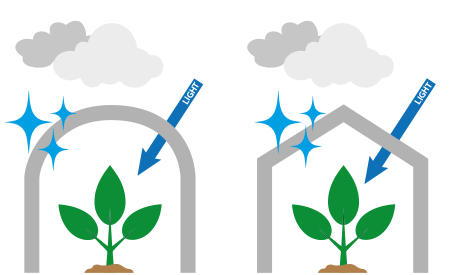 When natural light starts decreasing in early autumn, all the available light is needed for crop growth. Cleaning with Topclear results in a clean greenhouse roof for maximum light transmission. Mix Topclear with the required amount of clean water. Spray the solution evenly onto a dry greenhouse surface in dry weather and at a minimum temperature of 5°C (40°F). Minimum reaction time is 20 minutes before paint can be rinsed of, machine brushed or before rain can remove the paint. Only apply Topclear if heavy rain is expected in the next few days. Removal using roof sprinklers is not recommended. Read the complete instructions on how to use Topclear. Get more information on usage and mixing. Simply spray on Topclear, leave it to wash off in the rain, and you’ll have a clean greenhouse roof that allows maximum light into the greenhouse.